You can’t visit your social media platform of choice today without seeing something about Essential Oils. If the claims are to be believed, Essential Oils are the antidote to whatever ails you. They can help you sleep, help you wake, focus your thoughts, or calm your spirit. They are cold-curing, allergy-alleviating, skin-soothing, cancer-killing, dare I say life-saving ESSENTIAL Oils. Yet this natural remedy(?) is surrounded by controversy. Some of my friends swear by them, while others simply swear about them. Recently I had a conversation, via Facebook, about Essential Oils with some friends that fall in the former camp. I’m a bit of a natural skeptic regarding this non-drug wonder drug, which made for an interesting conversation. * I’ve changed names to protect their privacy, and have also edited and/or supplemented some comments for clarity and brevity. I’m curious as to what you think about this article: http://www.granolaliving.com/2012/07/why-we-dont-offer-doterra-young-living-or-other-multi-marketing-brands-of-essential-oils/. I didn’t read the whole article, but I’ve watched [my husband] Jonathan go from sluggish, depressed, emotionally withdrawn, staph in his gut…..and a lot of other things that no doctors or medication has helped [due to his Lyme disease], to improving in dramatic ways. Young Living oils have blessed and changed our lives. Jonathan was a skeptic, too…..after a month of using them, he’s not anymore.Incidentally, the article states that multi-level marketing Essential Oils companies say all oils can be applied without a carrier oil, but that is incorrect. In the Young Living guide book, there is a table that shows all the oils and how to safely apply it. There are only about 4 oils that they recommend applying without a carrier oil. She was speaking from a limited experience and limited knowledge, but claiming full knowledge. Our family has experienced positive results with essential oils in asthma, fevers, headaches, colds, pain, moods, blood pressure, allergies and focus…to name a few. We go through lavender oil like water. On bumps and scratches, bug bites, on kiddos feet to help sleep, in the laundry powder I make, in bath water. It’s a long list. Jonathan is taking NingXia NITRO which has been huge for mental health which was his biggest issue this last year.The thing that’s unique about oils, though, is that they cross the blood/brain barrier and can reach into the cells. Lyme is in the cells so modern medicine can’t reach it. It’s like mowing the grass and cutting the top off but leaving the roots. We learned that about 2 years ago and have felt pretty helpless. But learning recently that oils can cross that blood/brain barrier and actually bring health to the cells was huge for us. (4) the fact that, to my limited knowledge, no “mainstream” company has jumped on the bandwagon to start producing the oils and to commission studies to show their effectiveness. If the effectiveness can be tested and reproduced to the population at large, then there is a great deal of money to be made, so it seems to me that some of these large companies (pharmacology or otherwise) would want a piece of the pie and would want to legitimize the products through research. Again, I’m not saying the oils don’t work, because I have no expertise in that area, and I know that there are a lot of folks who would personally testify to great results. I’m saying I would be personally reluctant to use these potent oils without knowing a little more about how they work and what they are doing to my body as a whole. 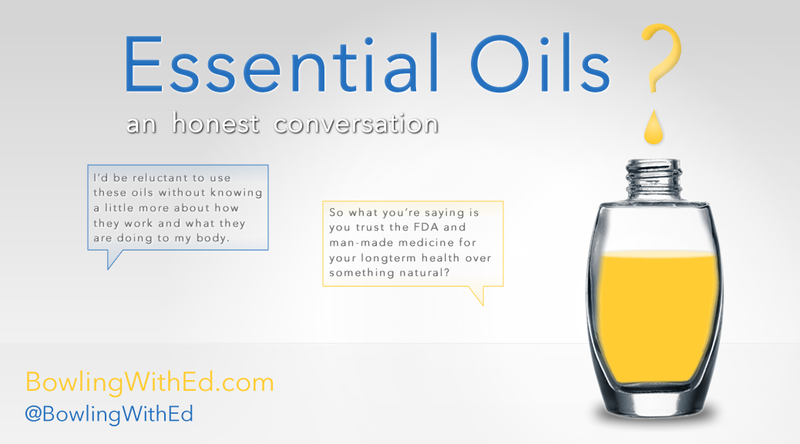 Share Essential Oils – An Honest Conversation on Facebook and Twitter. I completely understand where you’re coming from. Some people are more comfortable with modern medicine. It’s our mindset and how we were taught growing up. I think it’s not until someone is faced with something modern medicine can’t explain (or they have reactions to modern medicine) that we begin to question what we’ve been taught.I believe there can be “brainwashing” on both sides (both the medical and natural). That’s where we pursue what is best for our families.That said, oils/herbs have a much longer history than “mainstream” companies (as in thousands of years vs. 100 years or less), the FDA and Tylenol, and the long-term impact of “modern” medicine is much more harmful (I had a root canal 7 years ago that led to cancer on my ear). Big Pharm is as excited about legitimizing natural remedies as fire is interested in dancing with water. As I see it, the profit margin isn’t high enough for those companies, either. And why on earth would they want people healed? Ruins the customer base.BTW, I don’t personally like the MLM and marketing ploys used by select essential oil manufacturers (and haven’t bought into then, either), HOWEVER, God placed these things on earth for our use. I believe what once was common knowledge has been lost over the past century, and all but lost as to natural remedies. Interesting take on the profit margins. I’m curious, however, do you have evidence for that theory, or is it an assumption? If there are legs on that theory, then I think it is a good point, but it seems curious to me that a major company couldn’t derive a good profit from a successful multi-level marketing product.As far as Big Pharm’s lack of interest in natural remedies, if there is money to be made, I would imagine they would want to hit all potential customers, both the pro-med and the pro-‘natural’.Finally, as far as the “used for thousands of years” argument—I don’t doubt that some such products may have been utilized in early times, but the key question is how did they use them and in what concentration. I mean, I doubt Moses and Aaron were sitting around the campfire extracting the oils from plants using some early process.Again, I just feel like with a potent product (which the oils apparently are—pregnant and nursing mothers are apparently supposed to avoid use of at least some of them), I’d like some detailed (and regulated) information about dosage that doesn’t come from the company that makes more money the more I use. As to profit margins, I believe companies will do whatever they can for profit margins and repeat customers. That’s why not much big business is involved, especially since the effective remedies need potency and purity… not really their area. Bottom line is that I’m sure time and studies (if broad research occurs and/or continues) will reveal whether we are ushering in a new dawn of medical advances or whether Essential Oils are just another product in the line of multi-level marketing that fades away. If it is the former—that’s great. I just would rather let you all be the guinea pigs!As far as repeat customers, isn’t the whole point of Essential Oils continuous use for a variety of things (headache, backache, asthma, concentration, bad mood, good mood, help you sleep, help you wake up, cure your cancer, less common colds, and the list goes on). Like LovesLavender said, they use lavender oil like water.And really, if Essential Oils can cure cancer (and I’ve seen claims that they can), why are people saying “and I only get one or two colds a year now.” They shouldn’t so much as sneeze! Again – I don’t know what is accurate and what isn’t but I figure the best way to begin is a broad review of the literature – positive and negative. Let me frame the debate a tad differently. A doctor or nurse may write a prescription for Morphine. All three treat pain, all three have been shown effective by generations of use. Some humans are sensitive to one or more and cannot take them without an adverse reaction, the majority of people will not have an issue. Essential Oils fits in this analogy. I appreciate that. And it provides a great context for me to try and better explain one of my questions/concerns. Your examples involve products that provide clear parameters for use. If, for example, my cousin started telling me to smash up the Tylenol and snort it, I’d be reluctant to try it (to say the least), because I’m simply unaware of credible evidence that shows this won’t have a longterm negative impact on me.Similarly, IF the blog I posted originally (http://www.granolaliving.com/2012/07/why-we-dont-offer-doterra-young-living-or-other-multi-marketing-brands-of-essential-oils/) is true, and if “Aromatherapy and Herbal associations, organizations and health care providers (including both mainstream and alternative medicines)” all recommend against ingestion of oils, and if someone recommends that I ingest oils, I’m going to be very reluctant to do so without some reliable 3rd party information. Same argument for undiluted use. Are you trying to prove that oils are hazardous to our health or that you hate multi-level marketing companies? Please clarify. 1) I hate MLM companies and don’t trust them farther than I can throw them (and I’m out of shape so that isn’t far). Perhaps if I rubbed Essential Oils on my biceps… :-)2) I am not trying to prove that Essential Oils are hazardous to your health because I don’t know whether they are, and it seems there are some good arguments that they can be beneficial.My main concern, as I mentioned above, is the dosage, the application and the longterm effects. Those questions, combined with my skepticism of multi-level marketing companies makes me extremely reluctant to start rubbing, smelling or swallowing. One of the links the blogger gives talks about the safety of ingesting oils. Remember, even if you follow the guidelines listed on the back of Tylenol, you’re still putting stress on your liver.Similarly, taking an antibiotic under doctor’s orders can cause long-term trouble. Have you ever listened to the possible side-effects given when an ad plays on TV for a drug? Those are side-effects that can happen even if you follow the very clear parameters. My dentist never said getting a root canal can cause cancer. He only talked about the safety of it. Well, I try to avoid those drugs they advertise on TV too! But that’s the point really, is that the TV ads go on and on about the side effects and tell you to consult with your trained medical professional regarding dosage and application, etc. In contrast, with essential oils, it doesn’t seem like there is a clear consensus on dosage, application, or longterm use. (Or perhaps there is but I haven’t seen it). And I’m reluctant to swallow Tylenol, antibiotics and do anything else that’s not natural because of what I’ve seen it do to my body. To each his own. I don’t like to rub artificial fragrance on my skin because it can cause all sorts of problems.So what you’re saying is you trust the FDA and man-made medicine for your longterm health over something natural? As a side note, and this will open up a whole new can of worms, but just to throw it out there: I have a fundamental discomfort with the framing of natural versus man-made since nothing can be made that isn’t, at its source, natural.As far as your question, if I was presented with enough evidence regarding effectiveness and enough information regarding dosage and application and there was widespread acceptance of the reliability of that information, I’d love to try Essential Oils.I’m not anti-wellness, I’m just pro-informed decisions. And I have a very high threshold for feeling informed, ask my wife! I’ll add that the use of modern medicine isn’t as well tested as many people think. I only speak from experience as an Anesthesiology researcher, be it a brief stint.Tylenol was only recently tested in children for efficacy. The doses on the bottle are based on testing done in adults and then adjusted for weight.My last project was to take blood draws from children who were being treated post-op with Acetomenophine for pain. We took a draw every 2 hours from drug administration to drug admin. Checking liver markers at each draw. What they found was the dosage was too high across the board. And could be lowered or time frame changed since the drug wasn’t being processed as quickly as expected.Essentially what they found was the old way worked but lower amounts of meds could be given and over a broader time period with effective results. If you genuinely want to understand the oil debate, this is what I’ve learned. There are two schools of thought: British and French. The British focus on the aromatherapy side (inhalation). That’s what’s most commonly used and accepted in the US. It’s also what is easiest to understand. But the British side doesn’t have as high of a requirement for the quality of oils used, so ingesting would pose a hazard. The other is the French school of thought, which requires super-high quality oils for ingesting.The tricky thing is that Gary Young is the one who brought that school of thought to the US (he was a naturopath then started learning about the benefits of oils). This means that pretty much any search you do will somehow include him. Even if it’s a third party, you won’t be able to escape Gary. Most online searches are going to take you to blogging women without much knowledge (or ability to study French documents to understand the French school of thought). If you really want to learn, I can direct you to a bunch of books, but you will be hard-pressed to find unbiased info online. That’s what I’ve learned. I enjoyed participating in this conversation. I certainly don’t have all the answers; in fact, I probably have more questions now than I did before. Hopefully this conversation gives you some questions to consider as you decide whether oils are essential for you. 1) The fact that the essential oil movement was started by a naturopath (according to one of the people in this post….I haven’t verified it) basically tells me that essential oils are bogus, although maybe essential for bogus companies to make lots of money. 2) How on God’s green earth does having a root canal cause melanoma?? Seriously, anyone who makes that claim loses all credibility. 3) It’s conversations like these that make me lose all hope for educating people who insist on having irrational thoughts. I’ve seen similar reasoning when it comes to people who insist that vaccines are bad and a ploy for Big Pharma to make money, etc. They simply cannot see all the evidence to the contrary. It takes knowing someone who nearly dies or does die from getting the preventable disease.